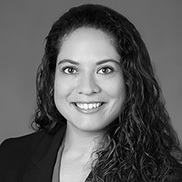 Based in the Firm’s South Florida practice, Haydee serves as Client Service Manager at Cherry Bekaert’s Wealth Management group. Haydee provides the financial advisors the support to serve clients with financial planning, investment advisory, risk management and plan consulting services offered in the group. Haydee began her career in the financial services industry in 2004 and has over 12 years of experience in wealth management. She brings a breadth of experience in back office services, where she started her career as a member of the operations department of a fixed income management boutique firm. She later transitioned to the front office operations at a registered investment advisory firm in 2013. Haydee is bilingual and is proficient in Spanish.